Nick Dunning surveys the college football landscape and provides you the correct sides in a week he labels as "CHAOS" week. When I look at the games week I see CHAOS! I think this is the week where things go completely haywire and everything we thought we knew about this college football season gets flipped on its head. Maybe it’s because it’s been a couple weeks since anything crazy happened, or maybe it’s because the schedules and matchups just line up for some exciting games and the pressure of expectations is going to be mounting on the frontrunners. I hope I’m right, because this looks like one hell of a week to me! Let’s dive in! When Sam Hartman went down, many were unsure how Wake would react, but there was a real battle in the preseason with Jamie Newman and it showed why last week when Newman stepped in and threw for 297 yards and 3 scores, leading Wake to a big road win at NC State. On a short week, no less! The short week, also means he had a few extra days to prepare and settle in to the job and that should only help the offensive production. I think Pitt will score plenty, having gone over 50 in 2 of the last three outings,and this one covers the total. The constant narrative is that Ohio State doesn’t look sharp or isn’t as good as they need to be to make the playoffs. The conspiracy theorist in me says that storyline is all just laying the groundwork to force two SEC teams into the playoffs, but I digress. 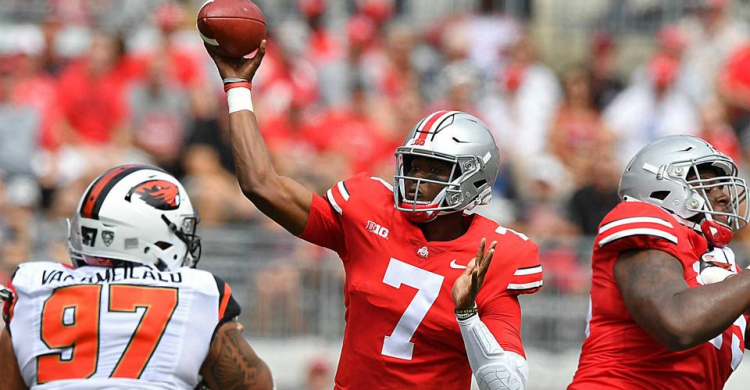 Ohio State is desperate for a strong showing and that’s a dangerous thing for a Terps team that’s lost 3 of their last 4 and also had their starting QB go down with an ACL tear last week. This has all the makings of an ugly day for Maryland. I might be on a limb here, but I think Eric Dungey has a little more magic left in the tank. It seems like the DIno Babers conversion has started to turn a corner and it’s not even a huge upset (relative to the Clemson one last year, or Va Tech two years ago). Syracuse has rattled off 4 straight wins since the back to back tough losses at Clemson and Pitt. WIthout real playoff aspirations, this becomes their biggest game left and I think they show up in a big way. At the end of the day, Dungey makes a bunch of plays with his arm, but it’s his legs that make the difference in a high scoring affair. Illinois will most likely be getting starting running back Reggie Corbin back in this one but *Spoiler Alert* - it won’t matter. It sure looks like Lovie Smith is on his final days for Illinois, losers of 5 of their last 6 games, all of them by 19 or more. The list of victors isn’t exactly the who’s who of the B1G, either (Nebraska, Maryland, Wisconsin, Purdue). Iowa is better than any of those teams and this one is settled by halftime. Quick, - Better hair, Will Grier or Mike Gundy? Tough call...but what isn’t a tough call is that WIll Grier is a stud and this game is going to be exciting. Oklahoma State has been struggling more with the run than the pass, giving up 353 yards rushing to Oklahoma and 244 to Baylor in the last two weeks. So there may be an extra dose of the ground game with Kennedy McKoy, Martell Pettaway, Leddie Brown, Alec Sinkfeld and there’s probably another stable of backs lined up behind them too. That should only help free up the potent air attack and at the end of the day it’s just too many weapons and too much offense for West VIrginia. This one isn’t overly complicated. Georgia Southern is really good and Coastal Carolina is not. GSU is coming off back to back losses (let-down game at ULM after a big win over App State and then a loss to a very good Troy team) and need to get back on track. This game should provide just that opportunity. This one is pretty similar to the last one. FIU is just a much better team and should dispatch the 49ers pretty handily. Charlotte does have a solid run defense, but they really struggle to score and FIU is a little better through the air, anyway. It’s a game you’re glad you don’t have to watch, but it’s a bet opportunity nonetheless. In the Battle for Los Angeles, We have to take the talent, right? USC has been anything but impressive lately, but UCLA hasn’t exactly been awe-inspiring either. In another game that will probably be hard to watch, we’ll take the Trojans and their highly superior roster. I haven’t yet decided if Connecticut just doesn’t even bother to play defense or if they’re really just that bad. Either way, they’ve allowed 49 or more in 8 of their 10 games this year, including twice in the 60’s. Man, that’s ugly. But we’ll take the easy over, as East Carolina also wants to go lightning fast and has the weapons to get out and run with them. They also aren’t a great defensive team, so there will be chances for David Pindell and the Husky offense to help push the total up as well. For the next round of craziness, this is the week we can finally put an end to the UCF mantra of “We haven’t lost in two years”. Maybe I’m just over them pretending they should be the #2 seed, but I don’t think this year’s team is a great team. Last year, they were very good, but they lost a lot defensively and have had a super cupcake schedule. I get that it’s not something they can control in the moment and you only play the schedule in front of you and all those other cliches, but this if the first real test for them and I think they fail. Cincinnati is a sneaky good team and their defense is legit. Mix in a heavy dose of Michael Warren and this feels like one of those games where they can exploit a suspect defense and just run the same handful of plays in a rotation to grind them into submission. Full disclosure, the numbers don’t necessarily indicate that, I’m just choosing to discount the numbers based on eye test of teams and opponents and a bigtime gut feel. I genuinely think Cincinnati is as underrated as UCF is overrated, and think that will come out Saturday night. Buckle up, this one is going to be fun. These guys are going to put on a track meet Friday night and will definitely score some points. I would recommend the over, but it’s already mid 70’s. I expect they’ll get there, with Memphis doing a lot of the heavy lifting with their super powerful run game behind Darrell Henderson, Patrick Taylor, and Tony Pollard. They’ll be matched by a high flying offense led by Ben Hicks and the super talented James Proche. For a G5 matchup, there will be a lot of Sunday players on these offenses. At the end of the day, Memphis just has more of them (and the best one in Henderson). This should be a great game to watch for a more casual fan, and Memphis takes care of business in the end.